Tested by Ride’s top performing pros and built for the established freestyle guy, the new Fuse is all the rage. Debuting Ride’s new Slime Tongue™ technology that offers better forward flex, response, and rebound with lasting dampening performance. Featuring the new FlexLight outsole for better cushioning, dampening and performance, along with Tongue Tied™ Boa® closure system for next level heel hold and customizable Intuition™ foam liner. 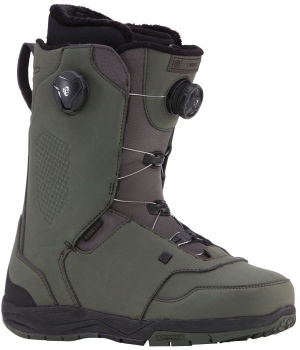 The fusion of new and proven technologies make for an explosive freestyle men's snowboard boot built to dominate. Bootfitter’s comments: The convenience of Boa meets the old-school precision of laces in the Fuse, a lightweight, powerful and versatile boot for all-mountain freestyle riding. 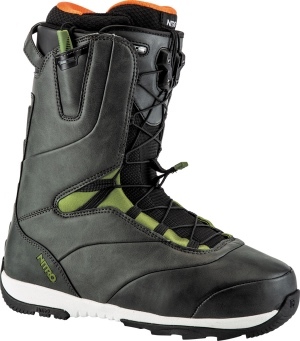 Rounding up the best, and most durable snowboard boot features, the Lasso has what it takes to provide rides with a lasting comfortable fit, and on-the-fly adjustment. Featuring the Tongue Tied™ Boa® closure system for award-winning heel hold, the easy-to-use shell lacing Boa® coiler, and supportive Intuition™ foam liner for a superior fit out of the gate. Ideal for all mountain freestyle riders, these Lasso snowboard boots will have you tackling terrain with new-found fervor. Bootfitter’s comments: A highly adjustable, supportive boot for anyone from the first-time buyer to the seasoned rider who wants a softer flex. Snugger heel pocket and Ride’s Tongue Tied system keep things precise and responsive. Street sessions and park lapping are hard on your kit and your feet. We’ve designed the Darko for no nonsense comfort and durability, and added our new BOA® Mobility Conda for superior heel hold without sacrificing range of motion of your ankle. Combined with heat moldable Intuition® liners and traditional laces for max fit, the Darko is a K2 classic that will keep your feet warm, comfortable, and dry. Bootfitter’s comments: Lightweight, with a smooth flex, proven fit and the reliability and precision of traditional laces, the Darko is a long-standing freestyle classic! A freestyle mainstay in our line for years, the Dialogue snowboard boot just keeps getting better. Salomon’s RF3 lateral flex panels deliver the perfect balance of support and freedom of movement. The Gold 3D Flex Liner and the Ortholite C2 memory foam insole hands over instant fit for park lap, after park lap, after park lap, after…you get the idea. Bootfitter's comments: Proven freestyle performance and durability! The Dialogue offers a medium flex, and is available in two different width fittings to accommodate any foot shape! No other boot has helped progress more riders to new levels in and out of the park. Offering the perfect blend of precision, strength, fit, and warmth in a comfortable lightweight package. The RUBBER OUTSOLE, EVA MIDSOLE, and FLEX LINK DESIGN provide the ultimate foothold, durability, and flex, while providing a broken-in feel right out of the box. For riders looking for a mid level-flexing boot that offers all the support for hitting the big jump, dropping the biggest cliffs, and burliest features. Fit and a sure foothold are what make a great pair of boots great and our CLOUD 5 LINER and DUAL DENSITY FOOTBED provide just that while keeping your feet warmer than a pair of Sorels. True Fit and Comfort are just a step away. Bootfitter's comments: The Venture is Nitro's premium freestyle boot, featuring a medium flex, Nitro's precise fit, and enough durability to stand up to a day-in day-out beating in the park.